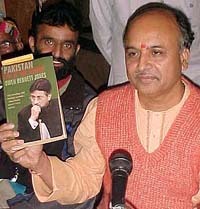 Mr Praveen Togadia, all-India general secretary of the Vishva Hindu Parishad, has dismissed the latest Pakistani peace initiative as a farce and said the ceasefire was only a ploy to gain time in view of the mounting pressure from the USA and other countries for tracing Bin Laden. Officials of the Food and Supply Department are trying to hush up a matter of the supply of kerosene which is not reaching the consumers of Mandi district and is sold en route to destination. Due to it the state is suffering loss of lakhs per month and this practice has been on for the past many years. Many of the gorgeous pheasants like the Edward’s peafowl and the Porneon peacock will be wiped out from the globe over the next three to five decades unless concerted efforts are made to save these species, cautions Mr John Corder, a conservation breeding expert, from the World Pheasants Association. 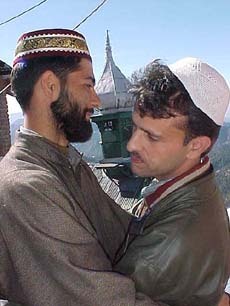 Muslim people gave the "Id" wishes at Shimla on Wednesday. The districts of Mandi, Hamirpur and Bilaspur have been chosen for implementation of the country’s first pilot project for early detection and management of cancer, with the Indian Council of Medical Research (ICMR) and the Regional Cancer Centre (RCC), here joining hands to strengthen the diagnostic and referral activities in the state. Rupees 9 crore sanctioned by the 11th Finance Commission in 2001 for setting up three diagnostic centres in the state lapsed two years ago without being used. The commission team is to visit the state in December. The Health Department is gearing up to start work on the project. The department fears lapsing of the funds if work does not begin before March 2004. Mr V.K. Ahuja, Sessions Judge, Mandi, today rejected the anticipatory, bail application of Rakesh Kumar Chopra, owner of M/s Grandlay Construction India Limited, New Delhi. Chopra is involved in a case of charging money from residents of Sundernagar on the pretext of sending them abroad. The police here has arrested the driver, Tinku of the car from which Rs 16 lakh were stolen while it was parked at main market chowk here on November 23. The police here registered a case against former BJP MLA of Nurpur Rakesh Pathania for disrupting traffic on the Pathankot-Mandi highway at Jassure yesterday. He along with party workers were protesting against the demolition drive of the subdivisional authorities at Jassure, the police said here today. Addressing a press conference here today, he said the ceasefire was not likely to last. He said Pakistan was targeting the economy of the country. India was well on way to becoming the second most powerful economy after China much to the discomfiture of Pakistan. It was hardly surprising that Pakistan had been working overtime to hurt the economy of the country, using terrorism as a weapon of attack. The bomb blasts in Mumbai and the attack on stock exchanges made its objective more than clear. The sensex had plunged by 130 points causing a loss of Rs 29,000 crore in the stock market, he said. Referring to the plans to build the Ram temple he said the sant samaj would meet at Ayodhya in the third week of December to chalk out the future course of action. On a complaint of a Non Government Organisation of Mandi district according to which the supply of kerosene was not reaching to various places and sold during its transportation. Consumers of Mandi district are suffering. The Chief Minister ordered inquiry into the matter. But top officials of department along with some political persons are taking advantage of absence of the Chief Minister and trying to hush up the matter. As per source 60 to 65 tankers of kerosene each containing 12000 litres are distributed in various parts of the district, each tanker is paid Rs 10000/- as fare to take the kerosene to the destination. But eight to 10 tankers do not reach the destination and distributed en route on exorbitant rates. According to highly place sources this practice has been going on for past many years and many officials, political persons, suppliers and the transporters are involved in it. It was further told that kerosene being sold at Pathankot for Rs 11 per litre hike meaning thereby the persons are earning lakhs of rupees as profit and earning lakhs of rupees on account of fare charged from the government and this amount is being distributed among the various parties. The matter came into limelight when the shortage of kerosene was noticed in the district and the N.G.O had write to the Chief Minister regarding this. Sources said the record pertaining to this episode has been sealed and the complaint pertaining to non supply of kerosene to consumers was found to be correct, it has been also established that the certain persons are gaining. A report had been sent to top officials of the department for action but the top officials hush up the matter and are trying to change the findings taking advantage of absence of the Chief Minister of the state. Officials of the department were silent over the matter. The District Food and Supplies Controller when asked about the inquiry showed his inability regarding it. If the alarming rate at which the population of some of the pheasants has been declining is any indication, our grandchildren will see them only in the form of stuffed trophies, Mr Corder, who was here as a consultant for the ongoing project of the forest department for the captive breeding of the western tragopan pheasant at Sarahan, told TNS here today. The gravity of the situation could be judged from the fact that out of the total 48 species of pheasants, as many as 27 were in the list of endangered species. While the Edward’s peafowl and Porneon peacock were critically endangered, 15 other species were in the highly endangered category. He had been working on the conservation of some of these species and had successfully implemented the programmes for captive breeding and subsequent reintroduction of the pheasants in the wild for the endangered green peafowl, Malaysian peacock and mountain peacock in Malaysia, game pheasant in England, Edward’s peafowl in Vietnam and Cheer pheasant in Pakistan. However, the conservation programmes had their limitations as not all countries had the requisite infrastructure facilities, adequate funds and trained manpower to implement them effectively and in a sustained manner. He said his latest concern was to make the programme for the captive breeding of western tragopan undertaken by the state Forest Department a success. The survival of the species would largely depend on it, as the Sarahan pheasantry is the only one in the world to have the rare bird in captivity. The species was fast heading from endangered to critically endangered category. The population of western tragopan in its entire habitat in the western Himalayas was about 5000 in 1997. However, a study conducted by a research scholar in the Himachal area indicated that the number had come down to almost 10 per cent over the past five years. Although the study was confined to a small area ,the indication that the population was declining sharply was unmistakable. There was an accidental breeding of western tragopan at Sarahan pheasantry in 1993 but since then no further progress was made. The western tragopan is most difficult to breed in captivity as the pair requires natural conditions for mating, which is preceded by a peculiar display of gorgeous colours by the male to attract the female. These colours appear only during the dance-like display and are not visible otherwise. He had suggested a number of steps to create a natural stress-free environment and changes in diet for successful breeding to be followed in the rearing of chicks. He has noticed a tremendous improvement in the condition of the pheasants over the past one year and was confident that breeding would take place now. A Rs 5-crore project had been prepared for the captive breeding and reintroduction of the pheasant in the wild. Mr Corder was all praise for the state Forest Department, which was pursuing the conservation-breeding programme for endangered pheasants. The breeding of cheer pheasant by parent-rearing technique was a major achievement as this had been done only in England earlier. The ICMR has already sanctioned Rs 1.20 crore for the project, which will cover a population of 10 lakh in the three districts. Data with the National Cancer Registry Programme of the ICMR had indicated that uterine cervix cancer constituted almost 30 per cent of all cancer cases in Himachal Pradesh. “The ICMR, RCC and the state health department are involved in the project, which aims at early diagnosis of cancer, resulting in institution of early and effective treatment leading to high survival rates,” remarked Dr H.L. Kapoor, Principal Investigator and Principal of the Indira Gandhi Medical College. Analysis of 10,000 cancer patients in the state showed that 80 per cent of the women suffering from gynaecological cancer, sought medical help at the advanced stage, reducing chances of treatment. To be implemented in a phased manner, the first year would be the preparatory duration, including undertaking of baseline surveys and training of the para-medical staff and other professionals. In order to reach out even to those residing in the far-flung villages, the infrastructure of the health department has been involved. The dispensaries, community health centres, primary health centres and district hospitals will be involved, along with the active participation of NGOs and anganwari workers. “Our objective is to pick up early cancers for treatment as only then will the benefits of advanced technology and techniques in cancer management reach the patients,” explained Prof Kapoor. The project will be monitored and evaluated by the Institute of Cytology and Preventive Oncology, ICMR, while the Department of Cytology and Gynaecological Pathology, PGI, has also been made part of the project. The project will also help the RCC and other institutes in acquiring additional equipment like mammography machines, Colposcapes and X-ray film processing units, so that the most common cancers of the cervix, breast and mouth can be detected in the initial stages. The preliminary surveys showed that cancers of the mouth and oral cavity were not so high in Himachal, due to the non-prevalent habit of tobacco chewing, as compared to other parts like Bihar or Haryana. Among rural women, there were much more cases of cervix cancer than breast cancer, in contrast to their urban counterparts. The three Himachal districts of Mandi, Bilaspur and Hamirpur were chosen for the project. But later Solan was included in place of Mandi later Rupees 3 crore was earmarked for each centre. A committee was constituted to prepare a blueprint of each centre. A year and a half back the committee members were, however, directed to curtail the project and prepare it for Rs 60 lakh in place of Rs 3 crore said a committee member. The remaining amount was reportedly spent on facilities at IGMC Shimla and Dr Rajender Prashad Medical College Tanda. A fresh planning was initiated by the committee, said committee officials. The Health Minister J.P. Nadda when asked about the diversion of funds said permission to divert the funds for the two medical colleges was sought from the 11th Finance Commission but after its refusal the funds were kept intact. So far now no funds have been received here at the zonal hospital here for the project. Chief Medical Officer Gulshan Narang said an allocation of Rs 47 lakh for the civil component had been received but no funds received. He said lack of space had been a major hurdle in the setting up of a centre. The proposal to demolish three staff quarters was awaiting clearance from the PWD. The Finance Commission team is to visit the State on December 12. Hospital authorities have been directed at least to lay the foundation stone of the centre before team’s arrival to prove that work was being done stated the CMO. Health Minister Chandresh Kumari on the diversion of funds being feigned ignorance about it but added that work would soon begin. Health Secretary P.C. Kapoor denied knowledge of the diversion of funds and added that the amount was intact. The Sundernagar police has registered a case under Sections, 420 and 120B of the Indian Penal Code against Het Ram, a travelagent, and Rakesh Kumar Chopra. Both of them had charged lakhs from 25 residents of Sundernagar on the pretext of sending them abroad. He had filed an application seeking anticipatory bail but it was opposed by the police on the ground that in this case custodial investigation was required. The court in its brief order held that the applicant had collected Rs 6.5 Lakh from 25 persons and the request of the police was accepted and the bail application was rejected. Superintendent of Police M. Chander Shekhar said here today that Rakesh Gupta of Rajpura had got an FIR registered in this regard. Mr Shekhar said the behaviour of Tinku and repeated changes in his statement made the police suspicious and he was arrested. He later confessed to the crime and named his accomplices in the crime. Kangra district additional police chief Santosh Patial said today a case under various sections of the IPC had been registered in this regard. Mr Chaman Singh yesterday assumed charge of the Secretary, Himachal Pradesh Board of School Education and Himachal Pradesh Technical Education Board, Board sources said here yesterday after assuming the charge he said that the result of the supplementary examination of the matriculation conducted in September last by the HP Board of School Education would be announced on November 27, 2003 and would be available on the Board’s web site http://www.hpeducationboard.nic.in after 5 p.m. on the same day. Sepoy Naresh Kumar of Chhounti village in Hamirpur district was cremated with full state honours at a crematorium near his native village last evening. The JAK Rifles’ jawan lost his life while fighting Pakistanis in the Baramula district on November 22. Hundreds of local villagers attended the funeral of the martyr. The funeral pyre was lit by a nephew of the deceased. Ms Saroj Kumari of Bali village yesterday made an attempt to commit suicide by consuming pesticide at her house. She was admitted to the Dr R.P. Government Medical College and Hospital, Dharamsala, the police said here today. The reason behind the step was not immediately known. The police has registered a case under Section 309, IPC, against Saroj Kumari.